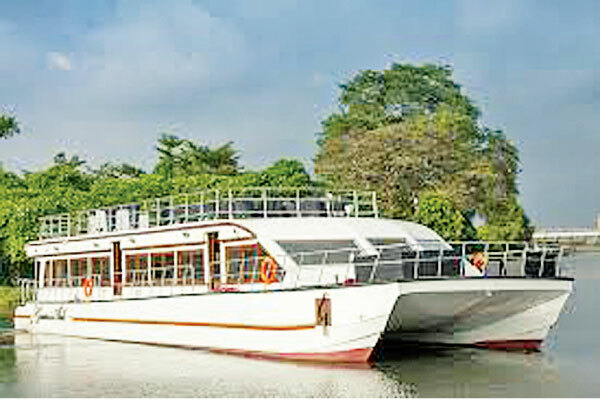 Garton’s Ark floating restaurant sailing from Weli Park Nawala Nugegoda is celebrating their fifth year in operation. In a bid to offer this service to more people we have now introduced a ‘budget buffet sail’ for every Tuesday night. The modernized double-decked vessel boasts luxurious interiors, cutting edge exteriors and eco-friendly designs. The lower deck holds a spacious fully air conditioned restaurant which can accommodate up to 80 persons. The spacious open upper deck, which seats up to 40 guests, has a comfortable atmosphere with cocktail tables and lounge area and is perfect to enjoy a variety of soothing beverages and delectable snacks and BBQ in the evening. “Passengers aboard Garton’s Ark will be able to enjoy a Diyawanna Oya river cruise that stretches over 3 km from Battaramulla to Nawala”. He said that safety has not being compromised as there are 125 life jackets in the vessels and a life guard on duty for every sail. “We also have two ex navy personal as Captains of the boat and there is also a standby boat in case of a medical emergency. Designed and built by Neil Marine boat builderd in Sri Lanka, Garton’s Ark is considered to be one of the largest sailing restaurant and leisure activity vessel in South East Asia.